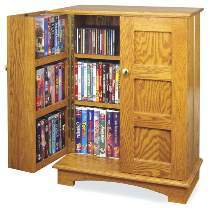 The 5-3/4" deep doors and cabinet back allow you to store any combination of CDs, DVDs or video tapes. Two doors swing open so all titles are easy to see. Measures approx. 32"H x 24"W x 13-1/2"D. Order #6368 Hardware package or Special separately. Audio Video Cabinet Hardware includes two brass plated knobs, two piano hinges and two magnetic catches. Project plan, wood and wood finish are not included. The #6369 Special includes both #W2966 Audio Video Cabinet Plan and #6368 Audio Video Cabinet Hardware.